Two big name former Nigerian stars are looking to make fresh starts in football. Taribo West and Celestine Babayaro, who together have turned out for some of the world's top clubs, have both gone through difficult times. Now the pair are keen to get their troubled careers back on track in Spain and the United States respectively. But they are heading to very different clubs. West is set to join a lowly Spanish second division side, whilst Babayaro is teaming up with the likes of David Beckham at the LA Galaxy. Whilst Babayaro played most recently at Newcastle United in the English Premier League, West has been plying his trade in Iran. But three months after joining Paykan FC, the widely-travelled West left the club by mutual consent. Now he is hoping for "a new lease of life" after his move to Spanish second division side Xerez CD. "It's a new challenge for me and hopefully I can get going again," West told the BBC. In his long career he has played for Auxerre, Inter Milan, AC Milan, Derby County, Kaiserslautern, Partizan Belgrade, Al-Arabi, Plymouth and Paykan. 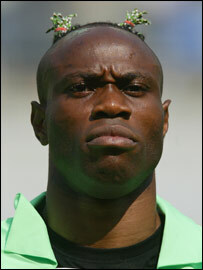 He won 42 international caps with the Nigerian national team and played in the 1998 and 2002 World Cups. After leaving Newcastle United in January, having been released from his contract, he has joined his former boss Ruud Gullit at the Los Angeles Galaxy in United States. That of course is David Beckham's club, but Babayaro is down to earth about his prospects. "First and foremost I want to get fully fit and get into contention", he told the BBC. "I'll hopefully do that sooner rather than later and the aim is to help this club achieve something big." Babayaro's career was badly hit by injury, and he is hoping his luck has changed. "Obviously I want to put the injury nightmares behind me because it had a negative impact on my Newcastle career", he said. "I'm really looking forward to returning to the nitty-gritty of football again, this time in the US. "I hope and pray I'll be a lot luckier with injuries."